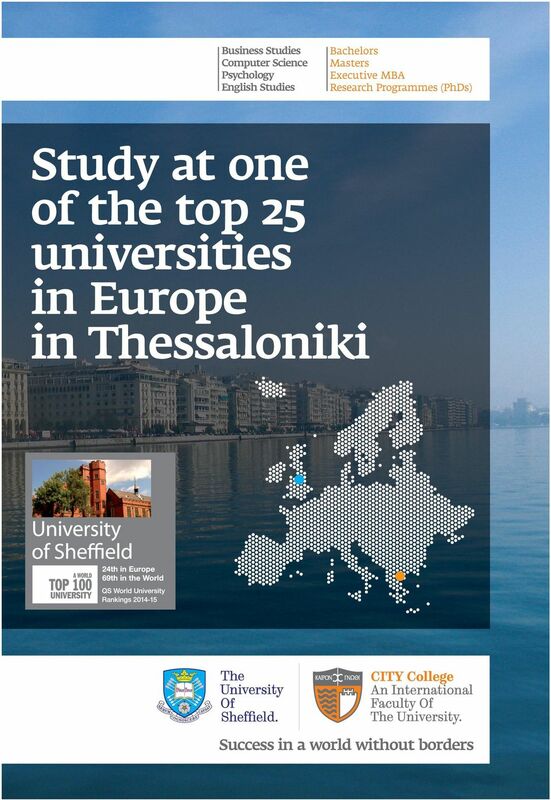 Download "Study at one of the top 25 universities in Europe in Thessaloniki"
2 The University of Sheffield International Faculty, CITY College Main campus: Thessaloniki, Greece Study for a top class British degree in Thessaloniki The University of Sheffield International The University of Sheffield is one of the Faculty, CITY College, is one of the six oldest British Universities. It is a leading faculties within the University and the only research university, located in Sheffield in South Yorkshire, England, ranked within one operating overseas, with its main the World s top 100 universities and campus in Thessaloniki, Greece. Bridging Europe s top 25 universities. It belongs to the UK with the South East and Eastern the 1% of the best universities in the world. 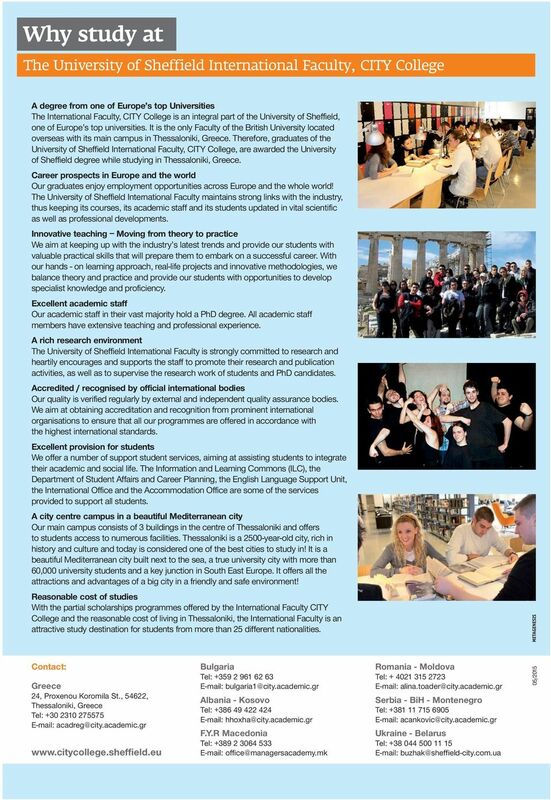 Europe, the International Faculty offers to Today, with nearly 24,000 students from students the unique opportunity to study 124 countries, and almost 6,000 for a top class British degree of the staff, the University of Sheffield is a University of Sheffield in their region. popular choice for university applicants. Accreditation and recognition BRITISH ACCREDITATION COUNCIL CITY College was first accredited by the British Accreditation Council (BAC) for Independent Further and Higher Education in February The College received BAC s re-accreditation in February NATIONAL ACADEMIC RECOGNITION INFORMATION CENTRE The degrees of the University of Sheffield that CITY College graduates receive are recognised and certified by UK NARIC. UK NARIC is able to confirm that holders of the University of Sheffield degrees who studied at CITY College should be accorded the same professional and academic rights and privileges as holders of any UK degree. Pursue a career without borders The value and status of the University of Sheffield degree, as well as the valuable skills and knowledge gained during studies The University of Sheffield among the world s best 5 Nobel prizes 24th in Europe 69th in the world QS World University Rankings reflect the successful career prospects of our graduates in Europe and in the world. BRITISH COMPUTER SOCIETY (BCS) The BSc (Hons) in Computer Science and the MSc in Software Engineering and Telecommunications of CITY College s Computer Science department have been accredited by the British Computer Society (BCS). CITY College graduates may become members of the BCS. The BCS is the industry body for IT professionals, and a Chartered Engineering Institution for Information Technology. The British Psycological Society The BSc (Hons) in Psychology offered at the University of Sheffield International Faculty, CITY College is accredited by the British Psychological Society (BPS). Join a rich research environment Academic research represents the backbone and students research activities within all of our philosophy and practice. academic departments. In order to promote The International Faculty fosters and research further, we have established the promotes cutting-edge interdisciplinary South East European Research Centre research and innovation, providing a (SEERC), which carries out substantial supporting environment for both academics research within the region ( Enjoy a truly international student experience ASSOCIATION TO ADVANCE COLLEGIATE SCHOOLS OF BUSINESS The University of Sheffield Business and Management Bachelors and Masters programmes and the Executive MBA at the International Faculty are accredited by AACSB. 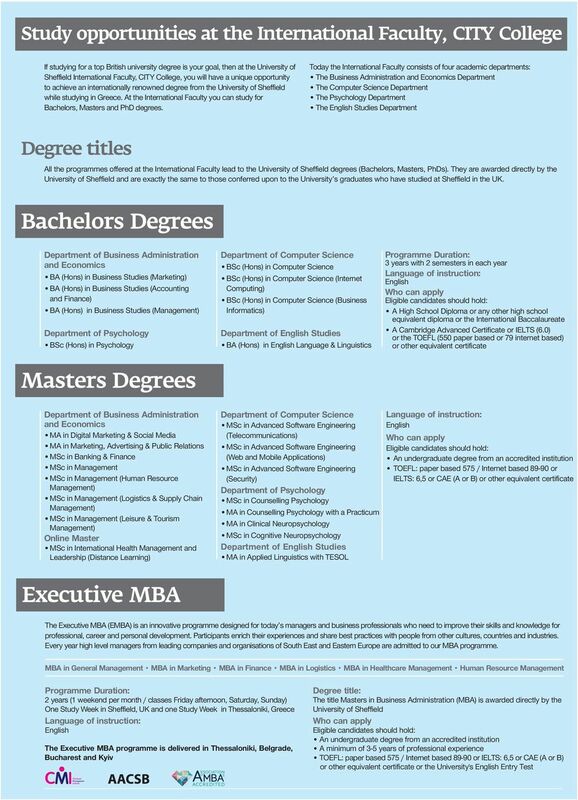 ASSOCIATION OF MBAs The Executive MBA and the postgraduate programmes MSc in Management (Human Resource Management, Logistics and Supply Chain Management, Leisure and Tourism Management) are accredited by the Association of MBAs (AMBA). Stretching across borders, the International Faculty embraces internationalisation and gives to its students the experiences, curricula and traditions of the University. We aspire to transfer knowledge, in-depth research and academic excellence across the region. The dynamic international environment of the University of Sheffield International Faculty comprises students and highly qualified faculty members from more than 25 nationalities. This unique mixture adds even more to the overall learning experience in a truly international environment. Chartered Management Institute (CMI) The Business and Management programmes (Bachelors, Masters, Executive MBA) offered by the International Faculty are accredited by the Chartered Management Institute (CMI). Graduates of Bachelors programmes may additionally receive the Level 6 Diploma in Management and Leadership while graduates of Masters programmes may receive the Level 7 Diploma in Strategic Management & Leadership. 4 Research Programmes (PhDs) The South-East European Centre (SEERC) is the research centre of the University of Sheffield International Faculty, CITY College, established as a non-profit legal entity in Thessaloniki, Greece. Founded in 2003, it conducts multidisciplinary research in the fields of Enterprise, Innovation & Development, Information & Communication Technologies and Society & Human Development. Our dedicated research centre promotes and supports a wide array of Duration of studies: 3-4 years full-time, 6-8 years part-time disciplines, and positions itself as a cross-border institution functioning within the EU while based in South East Europe. SEERC receives funding for a significant number of projects by various funding agencies and funding programmes, including EU-funded research. 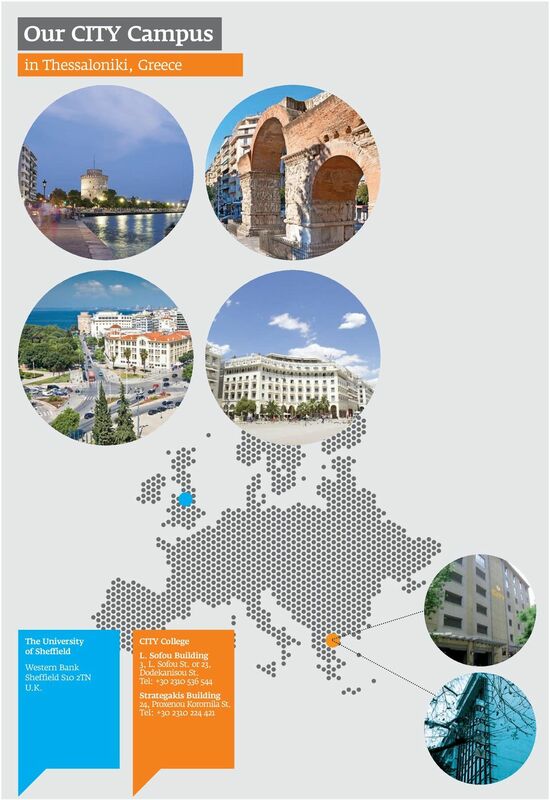 The features of the SEERC Doctoral Programme constitute a unique opportunity to undertake doctoral study in Thessaloniki, Greece, enjoying the benefits of an international community and academic environment. Read more about SEERC s Doctoral Programme at Student Life A unique educational experience in a historic city The International Faculty equips you with cutting-edge knowledge while providing you with opportunities for an exciting student life. Discover your real self, invest on your talents, develop your unique abilities! Information and Learning Commons (ILC) The International Faculty s state-of-the-art multi-library, known as the Information & Learning Commons (ILC) is a pioneering facility, a benchmark of high quality learning environment and study experience. In a 2,000 m² space, ILC integrates a rich library collection, individual and group study spaces, a multimedia room, wireless access to the Internet, PC labs, reference service and support from a variety of sources, including librarians and IT staff, including leisure and socializing areas. Computer labs Our premises host well-equipped computer labs to support formal teaching and the curriculum through the use of the latest technology. All computer labs have fast internet access and run updated software necessary for students learning needs. Also, a wireless network is available throughout all our premises, enabling students to work on their own laptop. Supporting our students Supporting our students during their studies is our main focus, so we offer a full range of student support services to our international students. Career services, accommodation assistance, counselling services, student visa provision and the English Language Support Unit are just some of the ways we sustain our students. Students clubs Student life goes far beyond classrooms, essays and exams. 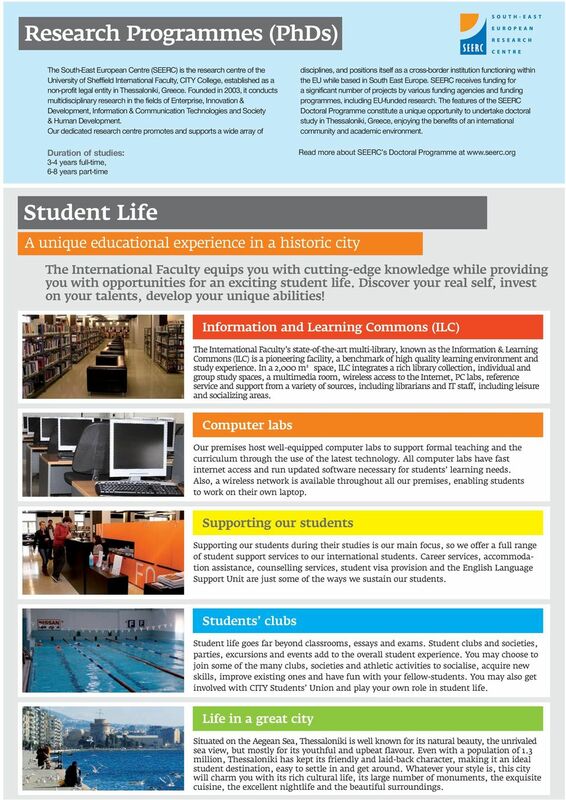 Student clubs and societies, parties, excursions and events add to the overall student experience. You may choose to join some of the many clubs, societies and athletic activities to socialise, acquire new skills, improve existing ones and have fun with your fellow-students. You may also get involved with CITY Students Union and play your own role in student life. Life in a great city Situated on the Aegean Sea, Thessaloniki is well known for its natural beauty, the unrivaled sea view, but mostly for its youthful and upbeat flavour. Even with a population of 1.3 million, Thessaloniki has kept its friendly and laid-back character, making it an ideal student destination, easy to settle in and get around. Whatever your style is, this city will charm you with its rich cultural life, its large number of monuments, the exquisite cuisine, the excellent nightlife and the beautiful surroundings. (MSc) Management (Leisure and Tourism Management) FT Management (Leisure and Tourism Management) PT CBET07 CBET08 CBET05 CBET06.